Posted in: Business, Lansing History. Tagged: Henry G. Lewis, Lansing Toy Gun Company, William Tell Crossbow. The William Tell Gun was a crossbow, three feet long with a hardwood stock and a steel crossbow. The bolt [arrow] has a steel tip and was about eight inches long. The way the bow worked was that a bolt was inserted into the chamber marked b in both drawings. The bow was drawn back and released by the trigger. The William Tell crossbow was considered safer then a traditional crossbow because having to chamber the bolt and constraining the bowstring to a groove prevented premature discharges. It was thought the crossbow would be so popular that it would replace traditional archery in lawn target shooting. Let’s not kid ourselves; this was a weapon, which given the torque on the springs on the crossbow, could do some serious damage. The bow was the creation of Henry G. Lewis, the brother of Charles B. Lewis [M. Quad] a noted humorist. Schultz was Manager, Michigan Stave and Barrel Works, Wellings a local physician, Hurd owned a General Store, Bradley was Cashier at Central Michigan Savings Bank, Williams a Traveling agent, Rouse an attorney, Forester a store owner, Edson, may have been Albertus Edson a Clairvoyant physician and Allen who is unknown. Posted in: Lansing History, Parks. Tagged: Belvidere Park, J.H. Moores, James Henry Moores, Parks, Resort. The plat for the Hollister & Skinner addition to the city of Lansing has been recorded, and men are now at work preparing the tract for the spring building. The plat is between baker street, the first street south of the C. &G.T. depot, and Linden avenues and Washington avenue, and a line marking some seven blocks to the west. It is platted into lots of four by ten rods, in blocks of ten lots, with alleyways and streets all laid out. There are 265 lots in all, covering a tract of land 116 acres in extent. There are ten avenues named Sparrow, Barnes, Smith, Beale, Osband, Bradley, Davis, Todd and Coleman, and Peck and Bank streets. The great feature of the new addition if Belvidere park, a large tract adjoining the river just above Glen island. It is dedicated to the public, and will when completed make one of the prettiest resorts in the city. In the center will be a sizeable lake named Jordan lake, after Rev. H.S. Jordan. On a high hill in the western portion will be a summerhouse to be known, as Temple Hill house, and a pavilion will be erected in the southern portion of the park, adjoining the addition proper. A boat-house on Jordan lake will be a continual source of pleasure during the summer months, and the river is to be easily reached by a pleasant stream of water that will land the boating parties directly back of Glen island, which is one of the most charming islands to be found in the vicinity of Lansing. The park is threaded with pleasure walks and drives, and in fact, the whole is planned with admirable judgment. The street railway will enter the addition at Barnes avenue about midway between Baker street and Linden avenue; and at Bank street, which runs southwestward with the L.S. & M.S. railway. On Barnes avenue the street railway will run west through fully three quarters of the addition terminating with a depot on Bradley avenue, only a block from the park entrance, which is reached by passing over two charming rustic bridges. The extreme southern portion of the addition, between Smith and Linden avenues, will be devoted entirely to the manufacturing purposes, and the right-of-way has been reserved through blocks 18-23 inclusive for a L.S. & M.S. Sidetrack. It Will Cost About $15,000 and Will be Fitted with All Modern Improvements — The Place Will be Opened on July 15 — Description of the Spot. Lansing will soon have another resort, which will vie with Leadley’s park for the patronage of the people. The beautiful Belvidere park at the terminus of the Washington avenue streetcar line is to be opened up by E.C. Beecher, formerly manager of Leadley’s park, who will erect thereon a beautiful $15,000 hotel and casino, the plans of which are now being draughted by Frank L. Hollister of Saginaw. There is no more beautiful site in central Michigan for such a resort. The park is heavily wooded and will be laid out in beautiful drives and walks. The ground slopes gradually back from the beautiful bend in Grand river until it reaches a high ridge, on which the hotel will be built. facing the river and fronting on what is now known as Sparrow avenue. Through the middle of the woods runs a creek, which will be bridged at intervals with rustic bridges, thus adding much to the beauty of the spot. The hotel itself will be a model of beauty and modern architecture. It will be a two-story frame, surrounded on three sides by a 16-foot veranda and promenade. In dimensions it will be 132×192 feet. On the first floor will be a dance hall. 92×60 feet in dimensions, a reception room and lunch counter. The doors opening on the promenade will be made to swing upward so that the whole first floor will be practically converted into a fine, cool, summer house, through which the cool breezes can blow to cool the heated brow of pleasure seekers. On the second floor will be the living apartments of Mr. Beecher, a large public dining room and a reception room. Like the first floor, this too opens on a large veranda. The scenery surrounding the spot is exceedingly picturesque. A short distance down river rises Belle island, while above the grounds the swift flowing rapids almost verging into a waterfall will prove a continual source of pleasure to sightseers. A steamboat will without doubt be added to the accommodations, which will ply between the city and the resort, while at the grounds good boats will make the pastime of boating a rare pleasure. Manager Beecher Arranges More Entertainment for His Visitors. Lansing people will evidently not be in lack of amusement this summer. Two excellent resorts have sprung up within as many years and offer splendid attractions for pleasure seekers. Manager Beecher of Belvidere park is making every effort possible to bring his resort to the front, and is seeming to even outdo all his former successful attempts. He is now arranging for a series of excellent entertainments or exhibitions, to be given under an immense pavilion, with seating capacity or 1,500. The first of this series will be given on Thursday, Friday and Saturday of this week. A company of artists has been secured and performances will be given twice daily during their stay. Each day at 2 o’clock, a lady will make the foolhardy and marvelous drop of 175 feet from the top of the pavilion to the ground, hanging by her teeth from a wire cable. Immediately after this daring feat, the performance in the pavilion will begin. The evening entertainments will begin at 7:30 o’clock. The mystery is when Belvidere Park closed. James Henry Moores acquired the land in about 1898-1900 and worked to improve the property. He installed retaining walls, several bridges and his personal zoo, yep a zoo, whose inhabitants were the first residents of the Potter Park Zoo. The property was deed to the city by Moores on December 21, 1908. The donation encompassed 18 acres of land, with the stipulation by Moores that the property be named Moores Park. (LJ 12/22/1908 and SR 12/22/1908) . In 1878 Schuyler Seager, a friend of Moores gave him that inscription on a note which he on his desk where if remained throughout his life. The origin of the quote is disputed and is currently attributed to an unknown Quaker, there are several variants of the quotation. Posted in: Lansing History, People. Tagged: Charles T. Foster, Civil War, George E. Osborn, George H. Saxton, Horatio H. Larned, James A. Hamilton, James Kennedy, Marion D. Richardson, Michigan Soldiers Home in Grand Rapids. On January 1st 1936 there were seven Lansing residents still alive who had seen service with the Union Army during the Civil War (1861-1865). All were members of the Charles T. Foster Post Number 48 of the Grand Army of the Republic, a post that once enjoyed a membership of over 200 members. Now there were just seven soldiers left, they were James A. Hamilton, Marion D. Richardson, James Kennedy, George E. Osborn, H.H. Larned, George Saxton and Joseph Covert, here are their stories. “H.H. Larned, 91 year old Civil war veteran and prominent business man, of 102 South Walnut street. Died at about 4 o’clock Tuesday afternoon as the result of accidental burns at about 9 o’clock Tuesday morning, when gasoline, applied to a bandage about a sore on his right leg, was ignited by an electric reflector heating unit placed near the bed in which the elderly man was lying at the time.” A tragic end to a fascinating life. H.H. Larned was born in Hudson, Michigan on February 15, 1845, the son of Mr. And Mrs. William Larned. At the age of 5, his family moved to Minnesota. He attended the Groton Academy in Groton, New York, at the age of 17 enlisted in the First Minnesota Regiment of the Union Army. But because of the ongoing conflict with the Sioux the regiment was kept in Minnesota. Larned stated that he served with the 1st Regiment Cavalry “Mounted Rangers”, Company C. He fought in over 50 engagements with the Sioux and was part of an expedition to the Dakota Territory. He was later a scout and trader for the Northwestern Fur Company near old Fort Rice, North Dakota. In 1869 Larned moved to Lansing and entered the Crockery business with his father. He sold the business in 1919 and retired from the retail trade. Larned served as director of Lansing National Bank in 1871; he was president and director of the Lansing State Savings Bank and later director of the Union Building and Loan Company. Larned would act as the personal representative of Edward W. Sparrow and oversaw the construction of Sparrow Hospital. Born in Deerfield, MA on May 21, 1838, George H. Saxton would settle in Grand Haven, Michigan. At the age of 24 Saxton would enlist in the First Michigan Sharpshooters, Company B and compile an honorable war record, he frequently recalled his company’s role at the Siege of Petersburg. In 1877 Saxton would move his family to Lansing; where later he would become the Assistant Post Master under Seymour Foster. George H. Saxton died on July 15, 1936. Marion D. Richardson was born in Tuscarawas County, OH on April 10, 1846 He enlisted on March 17, 1864 with the 48th Indiana Infantry Regiment and for a period of time served under General John A. Logan. Marion enlisted when he was 17 and was with Sherman’s Army at Chattanooga, but was detached before Sherman began his famous march to the sea. After mustering out of the army on July 15th, 1865 in Louisville, KY., Marion retuned to Missaukee, Michigan where he worked as a surveyor. He would later move to Lansing to work as a clerk in the Auditor General office. In 1936 Marion served as the chaplain for the Michigan Department of the Grand Army of the Republic. He passed away on May 15, 1937 and is buried at Gunnisonville Cemetery. One of veterans of the Grand Army of the Republic that we know the least about is Joseph Covert. “Uncle Joe” Covert as he was known as to the residents of Potterville, Michigan died on June 1st, 1938 at the Michigan Soldiers Home in Grand Rapids. He was the only resident present at the home in Grand Rapids who had served in the Civil War; he had been a resident of the home since 1934. Joseph Covert was born in Tappan, Ohio and was 98 years old at the time of his death. He enlisted in the Company A, 3rd Michigan Infantry on February 14th, 1865 and mustered out February 13th, 1866 in San Antonio, Texas. He would later settle Potterville, Michigan and that is known concerning Joseph Covert’s life. James Kennedy was born in Jimtown, Ohio in 1840 and served with pride in the 154th Ohio Regiment which he enlisted in at the age of 17. There are some inconsistencies with the service information provided in James Kennedy’s obituary. The 154th Ohio Infantry Regiment was organized May 9, 1864, under Col. Robert Stevenson. James Kennedy enlisted on May 9th 1864 and mustered out on September 1, 1864. Kennedy could not have been born in 1840 and it is doubtful that he saw service at Gettysburg and Chattanooga; it is possible that he was present at the fall of Richmond and at Appomattox although by this time he had mustered out of the 154th Ohio Infantry. He may have enlisted with another regiment. James Kennedy passed away at the age of 98 on June 8th, 1938. George E. Osborn was a native of Maine and served in Company A, First Maine Heavy Artillery, reputed to have incurred the highest causalities of any company in combat on either side. One day in 1864, Osborn’s commanding officer, General Warren ordered a dress parade. As the unit formed up Lincoln passes the troops on horseback, Osborn recounted, “He (Lincoln) was a homely man, and we all noticed how tall he was. His legs were so long that even on a tall horse the stirrups were not far from the ground.” He also observed that Lincoln, “had a thinking face and his countenance was sad as if he had troubles.” Later Osborn would encounter Grant who delivered to the company the news, “Boys you won’t have to fight anymore. Lee has surrendered.” Oddly George E Osborn’s father in a weird twist of fate once employed John Wilkes Booth. George E. Osborn was born on September 15, 1847 in Maine, following his marriage he settled in Isabella County, MI and later in 1930 relocated to Lansing, MI. He passed away on December 2, 1940. The commander of the Charles T. Foster Post in 1936 was James A. Hamilton, a native of Ingham County; he was born in Meridian Township on December 6, 1848. At the age of 15 he enlisted in Company G, of the Twelfth Michigan Infantry. Conflicting accounts have Hamilton being rejected as underweight at 90 pounds when he tried to enlist in Jackson, MI or just too young. So Hamilton did what any red blooded American boy would do, he “skipped out” and joined up with the regiment in Little Rock, AK. James A. Hamilton saw combat at the Battle of Shiloh. His brother was taken captive at the Battle of Gettysburg and sent to Andersonville prison for 23 months. He would in 1938, recount a story of the wounded prisoners that he encountered towards the end of the war. “We treated them like our own men. One poor boy, fatally wounded was tended at once by our nurses after we had fixed a bed of grass and leaves for him. Then he said, ‘How good I feel!’ Those were his last words.” While on picket duty he witnessed Lee’s surrender to Grant and Appomattox. On July 1st, 1865 James Hamilton returned to Lansing and his mother. Hamilton was able to attend the “Boys in Blue” and the “Boys in Gray” reunion at Gettysburg in July of 1938. In 1940 he was appointed National Quartermaster of the G.A.R. He died quietly at his home on December 26, 1941, the last of Lansing’s Civil War veterans. Lansing overcame derision and setbacks to become a booming metropolis. Yet its rich history hides chilling legends. Bertie Clippinger plays tricks on the unwary at the Capitol Building, where the teen accidentally fell to his death when a game went horribly wrong. One of Lansing's founding families keeps a spectral vigil over its homestead, the Turner Dodge House. 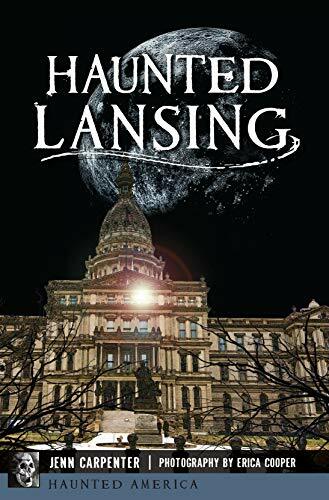 Malevolent spirits, believed to be either neglected students or victims of something far more sinister, stalk the derelict Michigan School for the Blind.